The competition started with a nice breakfast, where we could connect with students from other top European universities, such as Bocconi or the Frankfurt School of Management. The competition was a great opportunity to get acquainted with other students since the challenges are solved in teams of fours – your teammate and another randomly selected team of two. After drinking some wonderful creamy orange tea, the competition started with the Sales challenge by Unilever and the company left no doubts – we had four hours to prepare the presentation. The task was straightforward – introducing hair care products and selecting distribution channels in Switzerland – but the solution required some savvy. After the lunch the next step was the Marketing challenge. Swarovski did a great job in demonstrating their great corporate culture and firing up the participants. Everyone was eager to come up with a new marketing strategy, how to turn upside down the Swarovski watch business, so I can only recommend following the Swarovski marketing campaigns in the following months. We only missed Miranda Kerr from the show, but maybe next year. The 3rd, Pitch challenge was presented by BDO. We only had 2 hours, however the case had been distributed in advance. Word of wisdom: read the case in advance – we didn’t do it, and we really missed the wasted time, because every second counts in this competition. This is especially the case when you are tired – and after eight hours of case solving, you will be tired. The competition went on the following day, starting with the Baloise Strategy challenge. We simulated managing an insurance business (something actually used in corporate trainings) and it was simply the best simulation we have seen so far. It was a refreshing start on a Saturday morning so we were waiting for the presentations in a really good mood. I have to mention here the BGSG Team: they did a great job in organizing the event. Coordinating all four presentations of the 23 teams, it must have been a lot of work, but they arranged it with Swiss precision: without any delay or interruption. Thanks guys! But now let’s get back to the presentations. Our schedule was great, we had one-hour breaks between the presentations, so we were only worried about getting bored. We were wrong. It has probably been our most intensive Saturday afternoon, time passed really fast as we were constantly searching for the other half of the team, drinking tea or presenting the solution. We had 5-7 minutes per presentations, with short Q&A sessions afterwards. The nice thing about presenting to top executives or even the CEO himself is that you instantly receive feedback whether you were on the right track with your recommendations for their companies. After the challenges and the presentations, only the final challenge remained. At the announcement of the finalists we were really exhausted – but not for long – as soon as we heard our names, we grew lively again! For the finalists, the last challenge was a debate. Fortunately, we were somewhat familiar with the debate topics. In the semi-final we argued for stricter regulation of Bitcoin and in the final against introducing female board quotas. The best part in the final was that we actually competed with the team with whom we started the whole competition. 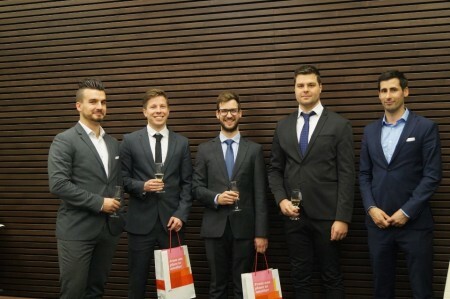 Although we didn’t win in the final, we still didn’t leave with empty hands – our team won the Sales challenge! And of course, the after party was another nice, last treat. It’s difficult to sum up two eventful days like these. If you want to know how it feels to speak in front of over a hundred people, then this competition is really for you. If you want to know how it feels to have only 15 minutes to prepare for that speech, well, all the more reason to apply next year! Overall, the BGSG was a great experience, and we really recommend everyone to try her or himself out next year. See you there!